What kinds of education banners do we offer? We offer Character Banners, Leadership Habits, Positive Behavior and Anti Bullying, Faith and Biblical Standards, Military Core Values and Patriotic Promotional Banners. Our ceiling banners come with a wooden dowel, ceiling clips, hooks and installation instructions and are generally 46x12x16 inches in size. In addition, to ensure the safety of your students, faculty and staff, our banners are fire-resistant and meet the standards set forth by your fire marshal. Instilling values in and developing the character of students is an important undertaking in today’s schools. Many — including public, charter and private — recognize this and already have programs in place to foster in students character words such as respect, self-discipline, perseverance, responsibility and courage. Regardless whether you have a well-established character development program or are just beginning to explore your options, Prosign Design is here to help. Our double-sided ceiling banners are $77 each, which includes all the necessary hardware for hanging the banners in your hallways. You can also order bilingual banners in a variety of languages for an additional $10 per banner. Our banners meet all fire safety standards, ensuring the well-being of your students, faculty and staff. Extend classroom learning beyond the bell — making the most of your instructional time. By emphasizing desired character words, you will promote a school culture of positive student behavior. Don’t worry about purchasing additional parts for your banners. All assembly components are included. 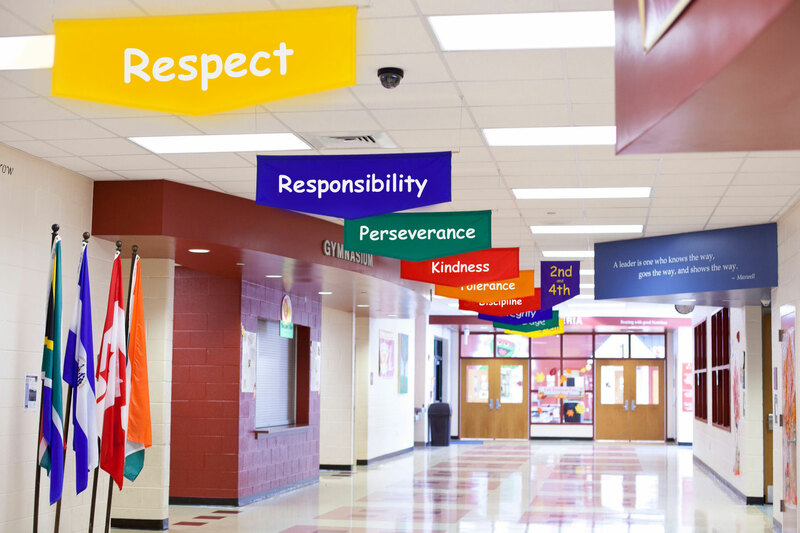 Transform the hallways of your school into learning portals for character education. Check out our list of these traits on our order form, and if you do not see the ones your school wants to implement, give us a call at 919.266.1121. These traits are also available for print in other languages. Very accommodating. Easy to reach and work with. great value and amazing customer support! This is my fifth order with your company and I have always been pleased with both service and quality of product! The entire experience from start to finish was positive. The product was well made and made a great addition to our school. The banners have completely brightened up our school! They look amazing! We love the posters and the kids are really excited to see them. Excellent design and professional look. They were very helpful and willing to go above and beyond what we needed. The discount was appreciated as well! Thank you again for accommodating us and our unique situation. Do you have any suggested funding sources for financing our character trait banners? Yes, there are many alternative sources of grants and funding to consider when paying for your character trait banners, including government programs and private organizations. Click here to learn more. Not at all. Typically, schools initially order in sets of 8 as shown above. Can we pay using a purchase order? You may pay using a purchase order as well as a credit card, a school check or PTA/PTO funds. For now, do not accept payment through PayPal. What is the turnaround time from when I place my order to when I receive it? The turnaround time typically ranges from seven to 14 days; however, during the months of May through August, be sure to allow additional time, as this is our busy season prior to schools reopening for the new school year. Do you install the character trait banners? Each character trait banner order comes with detailed installation instructions. We can also have an installation specialist help you via our website or walk you through your concerns over the phone. Can we order banners with the character traits written in Spanish — or even in both English and Spanish? Bilingual banners are available and cost an additional $10 per double-sided banner. We do not offer refunds unless the product is defective.